With Twin Turbo technology , the Euro 6 ENERGY engines (dCi 145, dCi 165 and dCi 170) offer more power than their Euro 5 equivalents. The ENERGY variants of the 2.3 Litre Master include twin turbo technology which enables you to combine torque at low speeds and high power to improve your driving pleasure. Your ENERGY engine includes 2 sequential turbochargers: - Your first low inertia turbo give you high torque from low speeds giving you greater responsiveness when pulling away from a stationary position. - At higher speeds the second inertia takes over allowing you to call on more power without running out of steam which gives you a smooth and steady acceleration. This system means your engine is always operating in its optimal yield bracket providing benefits for CO2 emissions and efficiency. 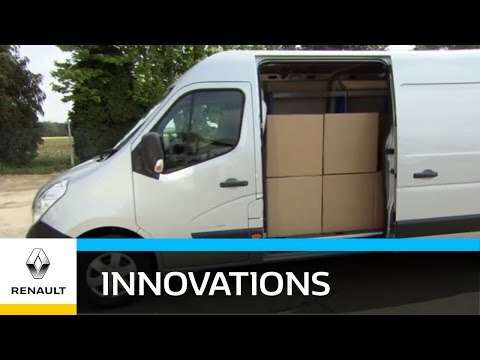 The Renault Master has been developed to meet the needs of professionals like you! Whether its your ergonomic adjustable driver’s position or your pivoting seatback table(1) in the central front passenger seat with plenty of storage space, we at Renault have engineered the Master to ensure you have everything you need close at hand! With our on-board infotainment including our DAB radio with Bluetooth * and AUX or even our R-Link Multimedia system(2) we keep you entertained whatever your journey. With our vast range of configurations you’re sure to find the Master that suits you! BUSINESS USERS ONLY. Finance provided by RCI Financial Services Ltd, Egale House, PO. Box 149, WD17 1FJ. Subject to status Guarantees and indemnities may be required. You must be 18 or over and a UK resident (excluding Isle of Man and Channel Islands) Contract Hire rates are based on 10,000 miles per annum and 36 months (6+35 rental). At the end of the contract you will not own the vehicle. Further charges may apply subject to mileage and condition at end of contract. Terms and conditions apply. Contract hire rates exclude VAT.